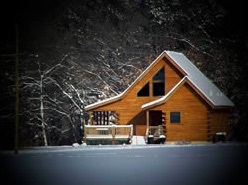 When you want to get away from all the hustle and bustle and relax, we’ve got just the place for you: Bear Grove Cabins in Mulberry Grove, Illinois. With a country setting and your own little retreat, it’s easy to settle in and just enjoy life. After raising three boys, innkeepers Sharon and Van decided to share their little slice of heaven with guests and established Bear Grove Cabins. The property includes 200 acres with woods, walking and nature trails, and a fishing pond—lots of room to roam! Though the setting is laid back, you’ll feel pampered here thanks to all the little extras Bear Grove Cabins does for you. Pre-order a crockpot meal and it’ll be delivered with homemade bread and a bottle of wine. Order breakfast and it will come the night before, so you can have it whenever you want in the morning. Guests also receive a complimentary snack basket—in the summer you’ll get the makings for s’mores! And when you leave you can take the engraved BGC wine glasses with you, compliments of Bears Grove Cabins. When it comes to lodging, you have two distinctive choices. Black Bear Log Home is lovely log structure with a covered front porch and spacious front yard. It’s decorated with a bear theme and designed to sleep up to eight, with two queen bedrooms on the first floor and a loft with three additional beds. 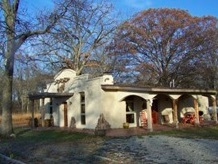 Cabina West is a Southwestern-themed adobe home with ceramic tile floors and covered porch. Two queen bedrooms and an additional queen sleeper sofa provide sleeping for up to six guests. Both cabins have baths, large great rooms, fireplaces, and full kitchens. Outside are BBQ grills and a campfire area. You’ll find that Bear Grove Cabins has all the comforts you could want in a getaway, and all the peace and quiet you dream of! Bear Grove Cabins is a member of the Illinois Bed and Breakfast Association … a unique lodging experience! This entry was posted in Illinois Bed and Breakfasts and tagged Illinois B&B's, outdoor activities by admin. Bookmark the permalink.